Step back into yesteryear with our fully restored 1918 International Char-a-Banc (bus). 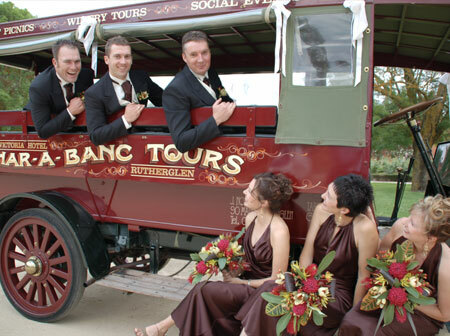 Book the Char-a-Banc for your wedding day. A unique and leisurely experience for the bride, bridesmaids and other fairies to arrive at the wedding ceremony on time. The Char-a-Banc is also a grand way for groups of up to 15 to spend a leisurely day visiting some of the local wineries, enjoying a gourmet picnic lunch at The Wicked Virgin and Calico Town Wines. Booking are essential and can be made phoning 02 6032 7022 or 0438 404 512.